Restaurants: There are six of them! Pedro is eager to please your family’s palate! We have six distinct venues dedicated to keeping the kids fed, cooling your thirst and providing a fun environment in which to dine. 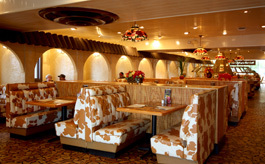 The Sombrero Restaurant ~ named for its unique structural appearance & theme ~ is a family-style eatery where you can relax & have a leisurely meal. Travelers wanting to leave their mark may make a small donation to The Shriner’s Children’s Hospital at this location. We will proudly match your donation & hang a handsome orange sombrero bearing your name on our walls! For a quick bite while you’re touring the grounds & seeing the sites, visit Pedro’s Hot Tamale. Here you’ll find short order favorites like fries, cold subs, sodas & plenty of water to cool you down after those famous tamales! The Peddler Steak House serves charcoal-fired steaks, prime rib, chicken breasts, savory seafood & hearty salads. Open for dinner only, The Peddler is a classic American restaurant that is ready to match your appetite with traditional meals done right. Pedro’s Ice Cream Fiesta has treats for the kids in a variety of flavors, and a special line of health-conscious ice creams & yogurts for Mom & Dad. Stop in after a day exploring Pedroland to cool down with a couple of scoops!